[111 Pages Report] The global market size of crude oil flow improvers (COFI) is estimated to reach USD 1.73 Billion by 2021 from 1.32 Billion in 2016, at a CAGR of 5.5% between 2016 and 2021. The main objective of the study is to define, describe, and forecast the COFI market on the basis of type, application, supply mode, and region. The report includes detailed information about the major factors (drivers, restraints, opportunities and industry-specific challenges) influencing the market growth. The report strategically analyzes the market segments with respect to individual growth trends, growth prospects, and contribution to the total market. It includes analysis of the COFI by type (paraffin inhibitors, scale inhibitors, asphaltene inhibitors, hydrate inhibitors, and drag-reducing agents), by application (extraction, pipeline, and refinery), by supply mode (direct and through distributors), and by region (Asia-Pacific, Europe, North America, Middle East, and RoW). The market size of COFI is estimated, both in terms of volume and value. The base year considered for the study is 2015 while the forecast period is between 2016 and 2021. Both the top-down and bottom-up approaches have been used to estimate and validate the size of the global COFI market and to estimate the size of various other dependent submarkets. Extensive secondary sources, directories, and databases such as Hoovers, Bloomberg, Chemical Weekly, Factiva, International Monetary Fund (IMF), World bank, Economic Co-operation and Development (OECD), International Energy Agency (IEA), Securities And Exchange Commission (SEC), and other government and private websites are involved to identify and collect information useful for this technical, market-oriented, and commercial study of the COFI market. The COFI value chain includes raw material manufacturers such as Lubrizol (U.S,) and BASF SE (Germany). Some of the manufacturers, such as Halliburton/Baker Hughes (U.S.), Schlumberger (U.S.) are also consumers of the products. These raw materials are supplied to the major crude oil flow improver manufacturers such as, Nalco Champion (U.S.), BASF SE (Germany), Clariant (Switzerland), Dorf Ketal (India), Lubrizol Specialty Products, Inc. (U.S.), and Infineum (U.K.). Furthermore, the COFI products manufactured by these companies are used by oil & gas companies such as British Petroleum (U.K.), ExxonMobil (U.S.), Total S.A. (France), and Saudi Aramco (Saudi Arabia). Oilfield services companies such as Schlumberger (U.S.), Baker Hughes (U.S.), and National Oil Varco (U.S.), Weatherford International (U.S.) are the users of COFI products. This research report categorizes the global COFI market on the basis of type, application, supply mode, and region. 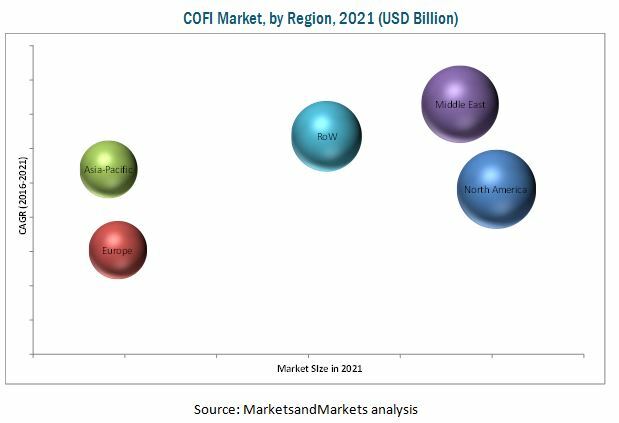 The global market size of COFI is estimated to reach USD 1.73 Billion by 2021 at a CAGR of 5.5%. Rise in worldwide crude oil production and increase in hydraulic fracturing, mainly from unconventional sources is driving the market. Different types of COFI are included in the report. The main types are paraffin inhibitors, scale inhibitors, hydrate inhibitors, asphaltene inhibitors, and drag-reducing agents. Paraffin inhibitors accounted for the largest-market share. Paraffin waxes are a major component in oil production and cause operational challenges by blocking the casings and oil pipelines, especially at low temperatures. Therefore, to avoid deposition of paraffin waxes, paraffin inhibitors are used in oil production processes and pipeline transportation of crude oil. COFI are included at various application areas, such as extraction, refinery, and pipeline. In 2015, the extraction application accounted for the largest market share, in terms of both volume and value, given the large number of oil wells across the globe and large volumetric consumption of this product in the extraction process. COFI are supplied through two major modes such as direct and through distributors. In 2015, the direct mode accounted for the largest market share between the two, in terms of both volume and value, because major oil & gas companies procure COFI by issuing tenders for the supply of the same. Direct supply mode is a prominent practice adopted by the suppliers, hence this is estimated to register the highest CAGR between 2013 and 2017. Asia-Pacific, North America, Europe, the Middle East, and Rest of the World (including Africa and Latin America) are considered the major market of COFI in the report. North America is dominating the global COFI market. The rising demand of COFI in this region is mainly driven by the huge shale oil reserves in the U.S. Moreover, removal of sanction on Iran’s oil & gas industry, heavy oil production in Venezuela (Orinoco basin), and huge reserves in Brazil is driving the demand of COFI in the Middle East and Latin America. Moreover, the geopolitical condition which is expected to smoothen in Nigeria and Libya is also seen as a driving factor for COFI in Africa. Though the COFI market is growing at a significant rate, the continuous decline in crude oil prices and the environmental challenges due to contamination of water table hampers the market growth. Additionally, the geopolitical issues in Africa and Middle East indirectly affects the demand of COFI. The Halliburton Company (U.S.), Baker Hughes (U.S.), Schlumberger (U.S.), and Clariant (Switzerland), are the leading companies, with an excellent foothold in the global market. These companies are expected to account for a significant market share in the near future. Other major manufacturers of COFI are Nalco Champion (U.S.), BASF SE (Germany), Dorf Ketal (India), Lubrizol Specialty Products, Inc. (U.S.), and Infineum (U.K.).